Welcome to the first of my new series, ‘Creative Inspirations’, where I shine the spotlight (not too brightly – I don’t want to startle them) on artists and creatives who inspire me and force ask them to answer all of my questions. This isn’t a series about Picasso or Rembrandt or even Anthony Gormley, though. Instead, it’s my opportunity to showcase some of the less well-known, up-and-coming artists and other creative folks I’ve discovered. These insanely talented people have one thing in common, they’ve all blown me away and inspired me with their talent and creativity and I want to share their work with you. I’ve already written a wish list of folks I hope to interview in the coming months, but I am delighted to say that Mike Matola, whose work I’ve fallen in love with, has kindly agreed to be my first victim subject. 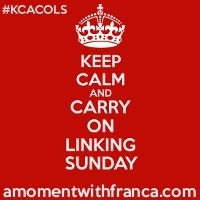 I’m a huge fan of his line-by-line posters, so I feel honoured that he’s agreed to be my ‘guinea pig’! 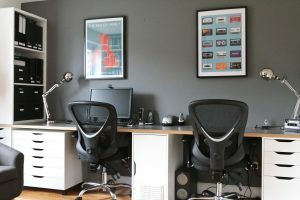 If you’re a regular reader, you’ll remember I was looking for inspiration for the blank wall in our living room, (click here). 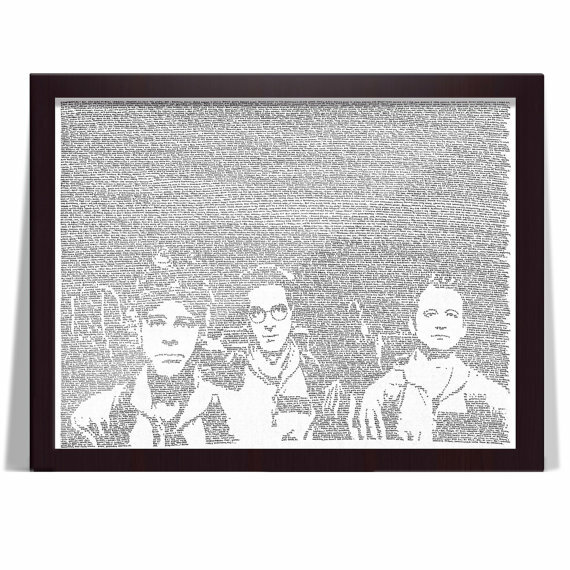 Mike Matola’s stunning line by line portraits featured on my wall art ‘wish list’. 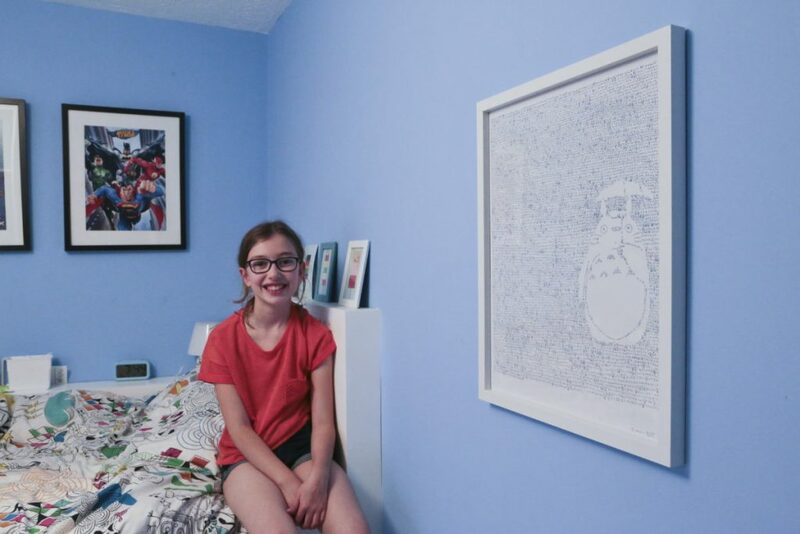 Although I haven’t decided what to do with my blank wall yet, Emily knew exactly what she wanted on her bedroom wall and dusted off her money box to buy Mike’s fabulous Totoro print, (find out more here). Mike’s hand-drawn line-by-line portraits are striking and wonderfully original. I always appreciate art that’s unique and represents a ‘labour of love’ and these eye-catching monochrome images certainly fit the bill. Mike’s work involves creating portraits using the written word. The words he uses to construct his images depend on his subject. 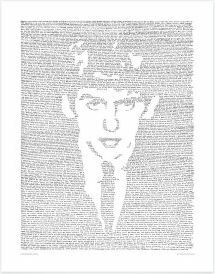 For example, his portrait of the Beatle, George Harrison, is made using hand-written lyrics from his songs. How cool is that?!! It took him over 80 hours of writing and craftsmanship to create his George Harrison portrait, painstakingly writing every lyric, moving line by line down the page and decreasing the space between the letter until the portrait took shape. In my opinion, it was time well spent because the final portrait is stunning. 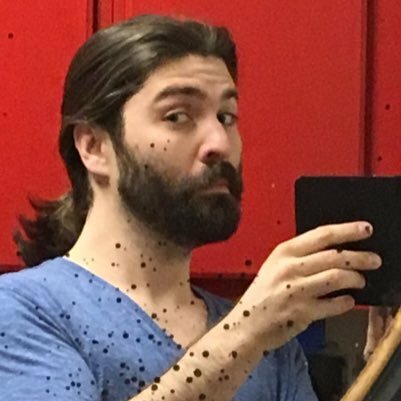 So without, further ado, let me introduce my first ‘Creative Inspiration’, the completely lovely and insanely talented, Mike Matola! Creative inspirations: An interview with Mike Matola. Mike Matola, member of the ‘bearded brotherhood’! I hate describing myself. I don’t know! Ask someone who knows me! I’m only going to tell you the character that I’d like to be. Not how I actually am. I’ll start out with some bad stuff too. I get angry if I get embarrassed and I’m cranky if it’s too warm or I’m super tired. There, that’s a more even playing field. 2. 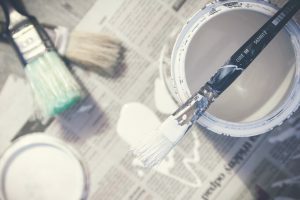 Are you a full-time artist or do you have another job? I am a full-time artist but I also opened a hair salon with my wife in Silver Lake in Los Angeles a few years ago (She’s the Hair Stylist). It’s called Foxtail Salon. I have an office in the back where I can work and my job at the shop is to fix everything and unclog the drains. So I’m an artist and a janitor in my free time 😉 Does that count? 3. I thought there was ‘nothing new under the sun’ until I discovered your line-by-line drawings. How did the idea of creating pictures from words emerge? I don’t know! I’m sure something like this has been done before. YEARS ago a friend’s birthday was coming up and I was broke. All I literally had was a sketch pad and some pens from the frozen yogurt shop I was working at. 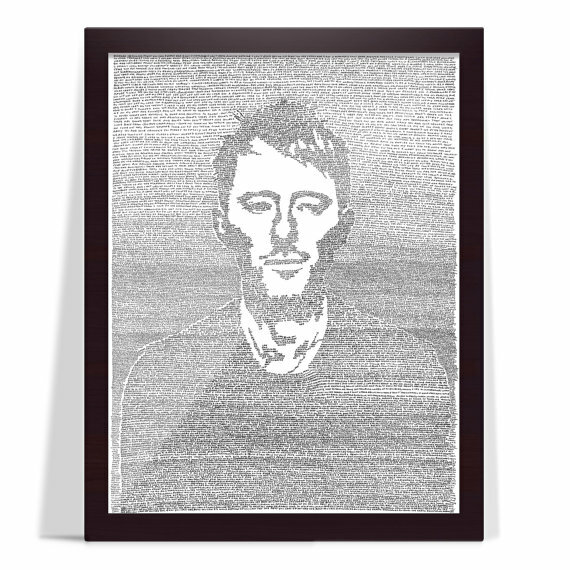 I was the ‘artist friend’ so she once said, “if you make any art whatsoever with Thom Yorke I would love it.” So I had the subject and the materials but didn’t really know what angle to take. I was doing a lot of cartoony stuff at the time and that didn’t really feel right. I think I was looking to do something more substantial. Something with more weight behind it. The amount of work writing out every song and lyric gave it the heaviness I wanted. But I didn’t even know if she’d like it! I spent weeks on it as just a shot in the dark. Literally a pen from work and a giant sketch pad. (she loved it). 4. What/who was the subject of your first line by line drawing? 5. Can you summarise how you create your line-by-line drawings? First step: most important step, picking out what I want to do. I once did a commissioned piece that was a subject matter that I wasn’t interested in and it was unbearable. I learned a lot but it was brutally boring. It really boils down to “Pick something people will instantly recognize, have a connection with, and most importantly, that you want to read and stare at for the next 40 hrs! Second: I find a scene, picture, imagery etc and map it out before hand. Then I use it as a stencil through a drafting paper or light box so I can see where to write. 6. Have you ever made a mistake whilst creating a line-by-line drawing? If so, what do you do? Tippex? I have touched up a few things digitally, though, after the original has been scanned, but it’s usually a sweat mark on the page or a slight smudge somewhere that is distracting to the whole piece. But I just power through mistakes and keep writing. (I had to google Tippex, I thought, “That’s got to be a British thing.” I was right! Never used Tippex or White Out or anything. It would ever blend right with the page, it’d be distracting). 7. Do you ever get writer’s cramp or word blindness? 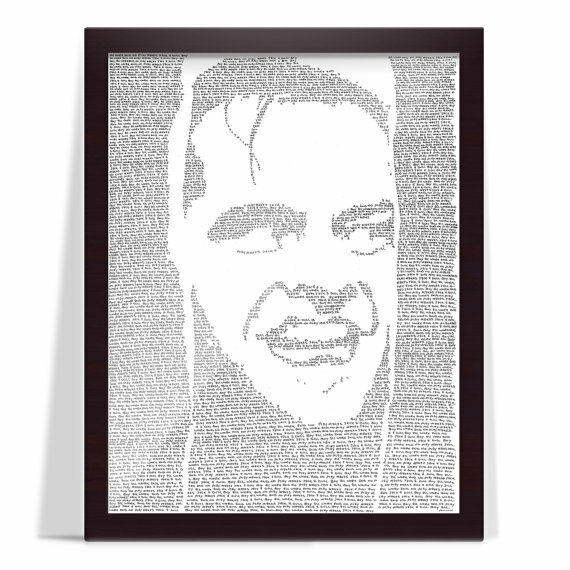 I don’t really get writer’s cramp too bad but when I did a portrait of Jack Nicholson from The Shining, I wrote “ All Work And No Play Makes Jack A Dull Boy ” repeatedly and I was forced to take breaks because I’d forget how to spell the words. Mike Matola captures the Jack Nicholson in ‘that’ iconic moment from The Shining! 8. How long does it take to complete one image? Give examples. Depends on the length of the piece and the subject matter. I’ve finished a smaller 11” x 17” in about 12 hours of work, whereas Totoro took me near six months to finish. It was running through mud the whole way! An 18” x 24” like Pulp Fiction or The Big Lebowski will take 24 working hours. I like to spread that out over a few weeks. 9. Totoro is my daughter’s favourite. 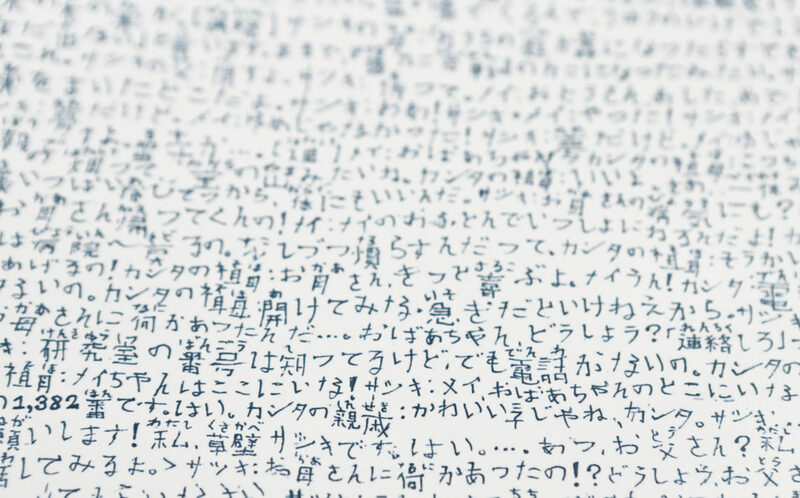 Why did you choose to write it in Japanese? How difficult was it – did it take longer? 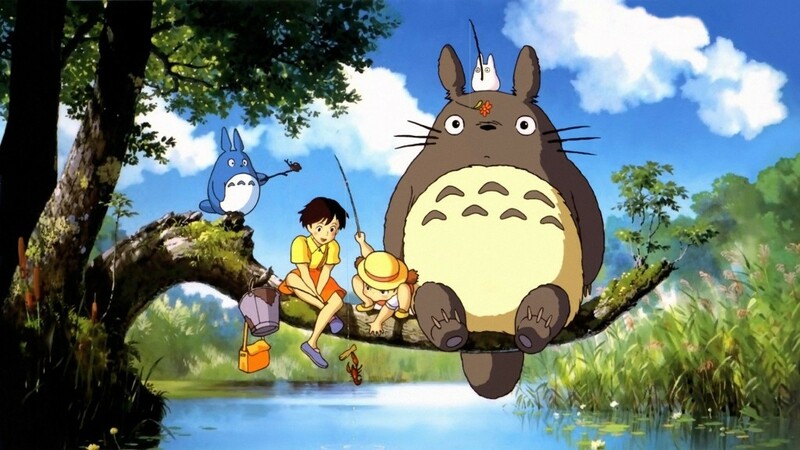 ‘My Neighbour Totoro’ is the 1988 animated movie classic from the Japanese animation studio, Studio Ghibli. I’m a big Studio Ghibli fan, (Japanese animation film studio responsible for Totoro). I even took the pilgrimage to the Studio Ghibli museum in Japan a few winters ago. I HIGHLY recommend it. I was doing more and more prints and I was kind of getting into a good groove so I decided to challenge myself. Do something different. Keep it interesting. So I figured I should do another language. What’s the hardest language? How about Japanese? Perfect! Let’s make things difficult! 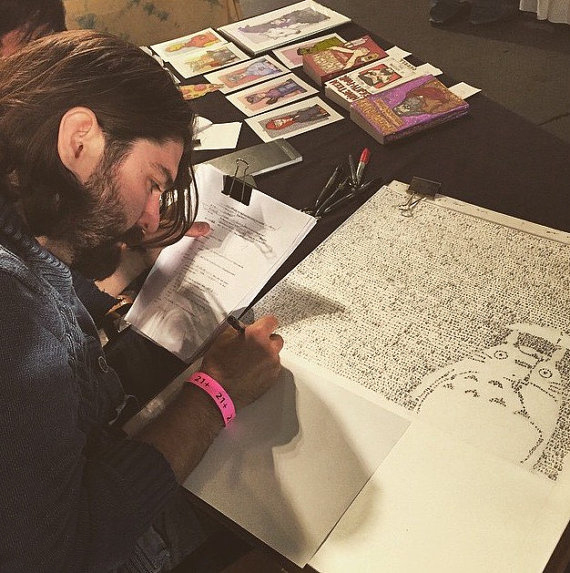 Mike’s line-by-line drawing of Totoro is in Japanese. I love Studio Ghibli films. Which one? Well my favourite is Kiki’s Delivery Service but I decided to do Totoro because he’s the original and kind of represents all the Studio Ghibli Films. I think one day I’d want to try and do all of them. Maybe top three. Wouldn’t that be something! Writing in Japanese is extremely difficult but also not difficult at all. I can’t read it so I broke it down to drawing thousands of tiny little pictures. I had a translated script so I could read along in English. I got a muscle memory for a lot of the more common used words. I still couldn’t read them but I would look at it and think “Oh hey, it’s that one again. I know that one!” and start drawing it. 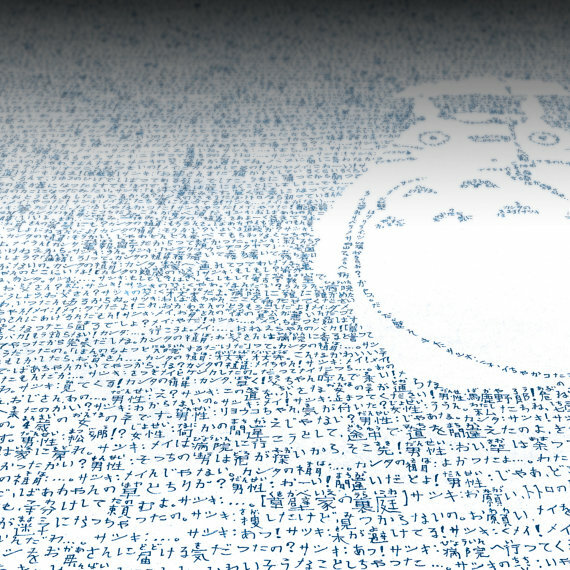 If you break the Totoro piece down into just a few hundred thousand little individual drawings it’s not that bad. How do you run a marathon? One step at a time. 10. Is this just the line-by-line phase of Mike Matola’s career? Or do you have other plans and projects? Ha! I’m constantly doing new things. I worked for Reading Rainbow for years as head production artist for their mobile app and helped them develop quite a bit of it when they first launched. I have a love of logo and business identity work so every once in awhile I’ll reach out and ‘cherry pick’ a gig like that. I just finished a logo for an artist’s project called #art64 all about connecting Video Games and Art. It came out really well. 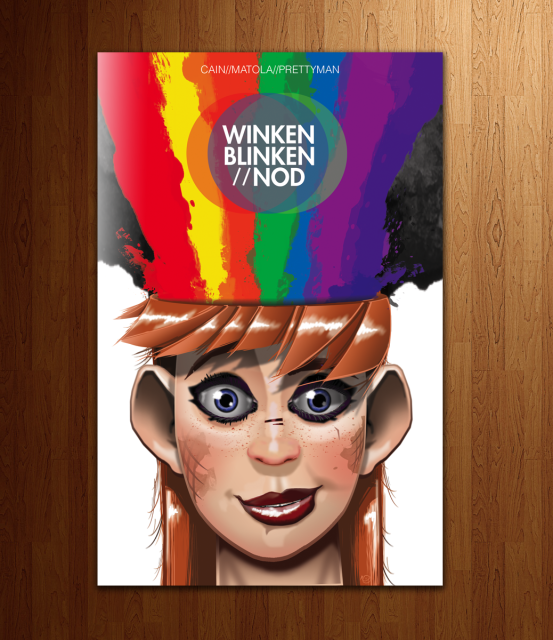 I also just co-wrote, art directed and released a comic book this year, ‘Winken Blinken and Nod’! Dream pirates in a flying wooden shoe. If your daughter likes Totoro I think she’ll really enjoy it. See www.WinkenBlinkenAndNod.com. I’ve worked in the entertainment industry as a writer out here in LA as well. I honestly just have a hand in everything. I like to build, draw, fix, and grow. Keeps me from being bored I suppose. I’m just starting to get into carpentry, so I build all of my displays and am starting to build for other artists’ as well so that’s exciting. And honestly, there are tons more things I have rattling around. I’m sure someone will call me needing something. So, yes, this is just a phase. Well, maybe not a phase. I like to see it as a tool in my toolbox. 11. What is your favourite line-by-line project to date and why? I like Totoro because it was so difficult and I really got a lesson in delayed gratification, but Ghostbusters might be my favorite. I love the framing and their expressions. I think only for that reason. 12. Who inspires you and why (in art and in life)? Everyone and everything! I just keep trying new things and surrounding myself with interesting people who are smarter than me. I find that takes care of the inspiration. 14. What is your favourite work of art (by another artist living or dead) and why? One of the first things that popped into my head was “Faces in the Fire” by Frank Holl. It’s so simple and its narrative is spot on. It does so much with so little. Everything about it is wonderful. It gives me the ‘good feelings’. All of them at once. 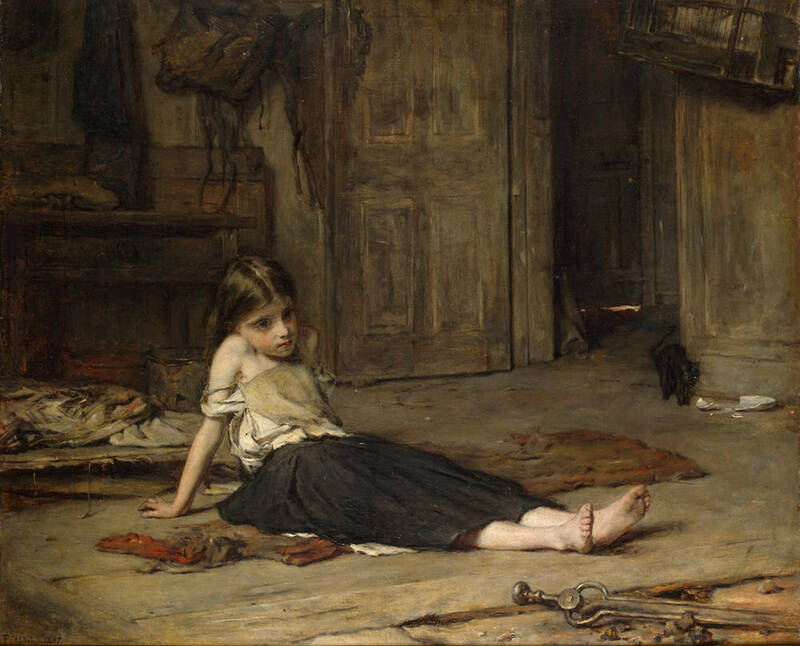 ‘Faces in the fire.’ by Frank Holl, 1863, oil on canvas. 15. What do you like to do when you aren’t drawing line by line? (Hobbies and interests). I’m usually working! But I like to host dinner parties with my wife for our friends. We love to cook and try new things so we never have a shortage of guests at the house. I do a lot of yoga and/or lift weights at least 5 times a week so that’s always good for the mind. I love movies and writing. My wife and I watch a lot of anime and we love to read! I just finished “Name of the Wind” by Patrick Rothfus. I hated the first 2/3rds and then suddenly I couldn’t put it down. I think he got better at writing as he went along. I’m starting his second book now. We have two cats and a dog. I travel a lot abroad when I can and go hiking up in the mountains at least a few times a month. I don’t know! It’s hard to have hobbies and interests when your work is your hobbies and interests! ‘Brooklyn’s On Fire’ by Nicole Atkins and/or ‘Fool In The Rain’ by Led Zepplin. I think it’s the kitchen, when I have a pile of apples to peel or a ton of dishes to do or some task and I have a podcast on in my earbuds and my wife is scooting around cooking something as well and I’m in my apron. I like working in an apron. I have a kitchen apron and a thick shop apron, both I love. 20. Tell us an interesting fact about you. I can balance a mountain bike on my chin. (truth). 21. What superpower would you have and why? ARGHH! What a good question. When I was a kid I really liked Cyclops. He was the leader and looked like how I thought I should look. Then I liked Wolverine because I was a teenager. Now I dig Colossus. I like his strength, armor, and kindness. I’d want to be able to become someone like Hercules or Captain America. 22. What would your dream commission be? Penn and/or Teller. I’ve dabbled with the idea of doing something of them but I can’t bring myself to start anything. I’m too close to it. But if they commissioned a portrait, I wouldn’t even care what it was. I’d be ecstatic. 23. Professionally, what is your goal? 24. What is the best piece of advice you have been given in life or in art? 25. Who would you most like to have as your number one fan? Oh geez, that’s so narcissistic! If I earned it somehow, Jackie Chan or Conan O’Brien. (But @ActorDougJones follows me on twitter and I’m still giddy about that, but I try to play it cool). Thank you so much, Mike! You’ve survived the very first Creative Inspirations Interrogation! 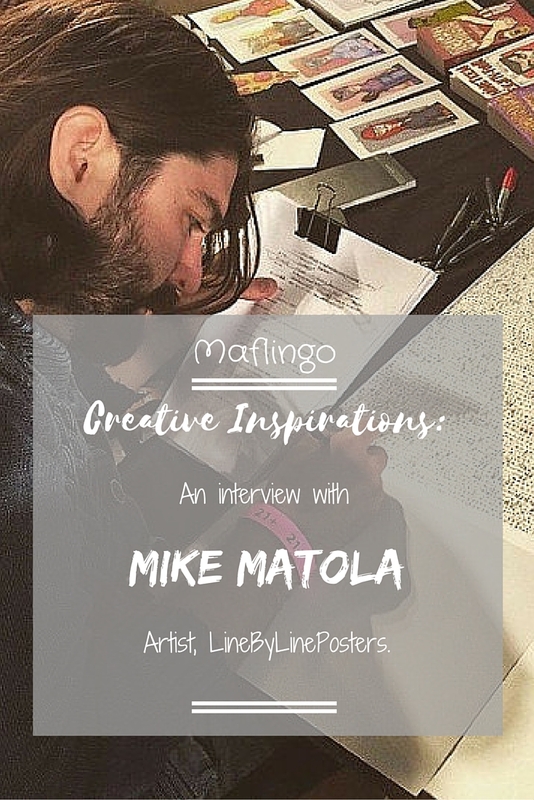 I think you’ll agree, Mike Matola is the perfect first subject for my ‘Creative Inspirations’ series. If you like what you see, please visit Mike’s Line by Line Posters Etsy store, (here). If you want to see even more of his fantastic body of work, including his logos, illustrations, and commissions, then visit his website: MikeMatola.com. I hope this has given you a flavour of what you can expect from my ‘Creative Inspirations’ series. I can’t wait to introduce you to more amazingly creative and talented people in the coming months, so stay tuned! As always, I’d love to know what you think of Mike and his work and what you think of my new series. He’s a great guy! I think you should start by balancing something a little bit smaller first, Emma! Yellow Joules bag? A Paw Patrol bean bag? Basically something that won’t squash and kill you if you drop it! Thanks so much for stopping by, Aba! She certainly does feel very special to have a signed poster and a little post-it note message from Mike! Fab interview. I have the Ghostbusters print, so it’s nice to know that’s his fave. He’s über talented. Can’t believe he did Totoro in Japanese. Amazing!! Hi Karen! I wouldn’t have discovered Mike if it wasn’t for you (I mentioned and linked in the post I did on my smushed bug wall)! I just love his stuff but I think finding out what a lovely person he is had made me an even bigger fan! Thanks so much, Geraldine. I was so excited about doing this series and I wanted Mike to be my first subject…Ever since seeing his work on Karen Knox’s Making Spaces blog. I’m so glad you like his work. I love the originality and the rest of his other work on his website is [retty incredible too. Thanks for popping by! What a guy!! Can he be my best friend please? Or at least invite me o er for dinner. Boy! Oh and his artwork is pretty funky too. Ha! Have you seen Mike’s new ‘Disney-fied’ Twitter profile? He needs his own Disney movie! Whoa! Very impressive and creative. Hats off! Thanks for stopping by and for your lovely comment, Lux. Thanks for your lovely comment, Helena! I really hope more people discover him and I can’t wait to share some more ‘hidden gems’ in the coming weeks! Thanks so much for your lovely comment, Charlie! I’m so pleased you like the series and like Mike’s art too. I have some great subjects in mind so I need to get myself organised and get interviewing….But as you know, it’s school holidays….Arghhhhhhhhhhhhhhhhhhhhhhhhhhhhhhhh! Thanks so much Cecile! I wish I had met him in real life but, alas, I did all of this via email. I really was blown away by his portraits. I haven’t had art have such an impact on me in ages. FOllow him on instagram @mikematola …He has posted a pic of Adele in recent weeks (and got married). wow what an amazing artist! his work is truly stunning! 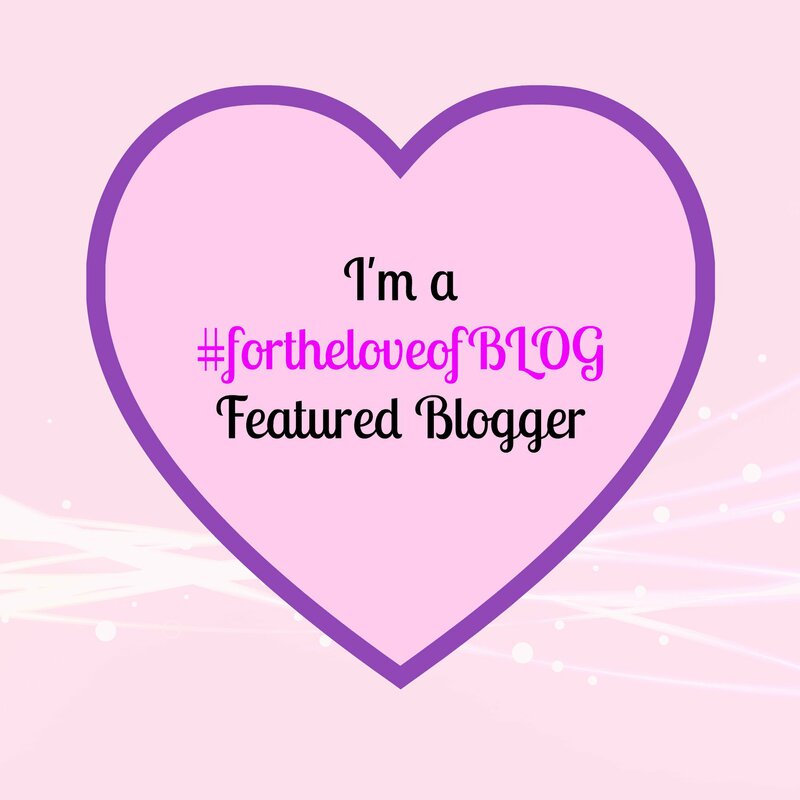 thanks for joining #fortheloveofBLOG, hope you can join again next week! Thanks so much for your considered comment. I love that his work is like that. I’m delighted he has another fan. I want Adele to see his Adele one! It is amazing! Yay! I’m so glad more people are finding out about him! I’d love someone famous to commission him! I’m glad you liked the interview, Ruth and are looking forward to the series! I’m hoping to contact some more of my wish list artists and creatives this week!